[Jewelry] Statement necklace by Beauty Unleashed. This is my first post about a jewelry item. I was not into jewelry earlier, but recently I love buying different pieces, especially necklaces. Even though, I still prefer rings and bracelets more! I am sure, by now everyone know the page Beauty Unleashed on facebook. They sell makeup, jewelry, bags, shoes and random things at a very affordable rates. The owner is very sweet and co-operative. I always had great experience shopping from that page. Whenever I bought jewelry pieces from them, they always came in a very cute packaging and wrapped well in order to reach safely. It is a perfect statement necklace, to jazz up your outfit. It can be paired up with any outfit, that is plain. With these pieces, you don't want to over do. Pair it with a nice shirt, tshirt, dress, flowy shirt or any outfit, and add a big ring and you are good to go. 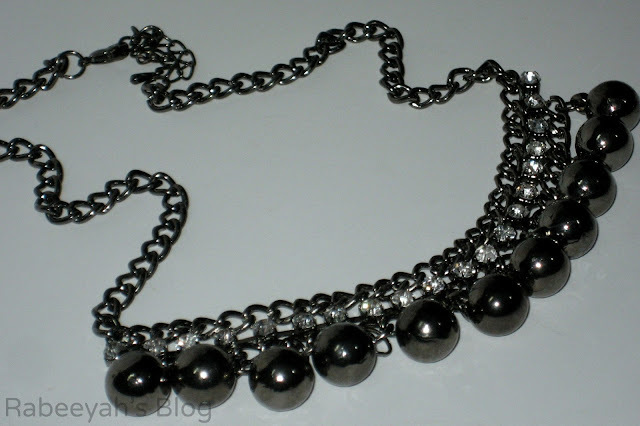 It is a metallic grey necklace, with diamantes and chain details on it. I love the balls on it, which gives it both casual and dressed up look! It is definitely a piece on which you will receive a lot of compliments. The material of the necklace is sturdy and heavy. I love this necklace, and it looks good with almost all of my outfits. Like the page Beauty Unleashed on facebook, if you haven't already and stay updated with all the sales and orders. She has some amazing jewelry pieces. I bought some more, which I shared on my Facebook page and on my instagram. Are you a jewelry person? Which type of jewelry do you like the most? From where do you buy? Disclaimer: PR Sample(s) sent for review, however this has not affected my review. The review is based on my personal experience after using the product(s). For more queries and information, head over to the Disclosure Policy. My God.. that's such an exquisite piece. Love it. Don't mean to spam but would love u to visit my blog. Please do follow if you like my lil blog. this is such a cute necklace and looks great on you! just come across your blog while web surfing an informative & nice blog !